NOTE:Â This renovation was done in our last house and completed about 3 months before we found out we were getting transferred and moving. So, unfortunately, I can’t take any more pics! We got such good feedback on it that we decided to include it here anyway. Â Apologies for photo quality. 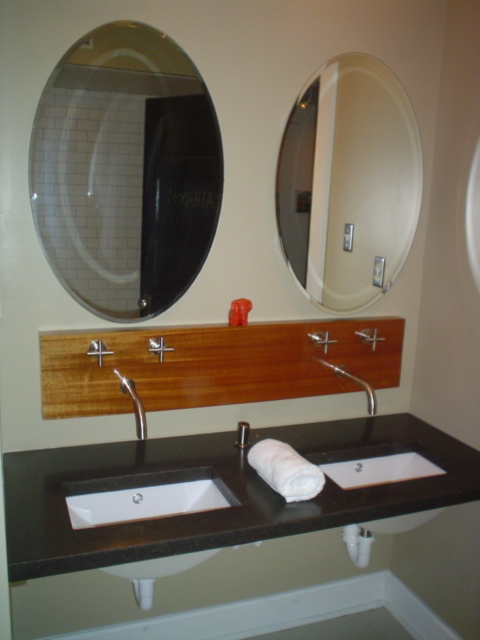 It was time to redo the bathroom, so of course I start looking for ways to trim the budget so this can actually happen.Â How much do I love Kohler’s Purist series wall mount faucets, but at $500 each (I needed 2) that was eating a lot into my budgetÂ -Â I had to replace the countertop, sinks, mirrors and floors too!Â Enter my old friend e-bay.Â I found really good knock-offs for $99 each (faucets_outlet).Â So the rest of the renovation now revolved around them. 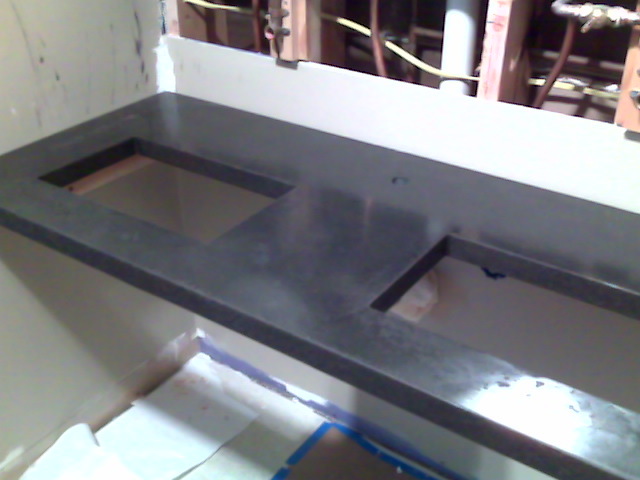 My better half had been chomping at the bit for a concrete project and here was his chance.Â He did a bang-up job building the form and pouring the countertop and then we had to wait a month for it to cure.Â The agony!Â Details on his process are in the comments below.Â All told, we pulled off everything you see in the photo of the complete vanity area for about $550.Â The paldao veneer for the plywood box housing the faucet connections was one of the bigger splurges at $100. 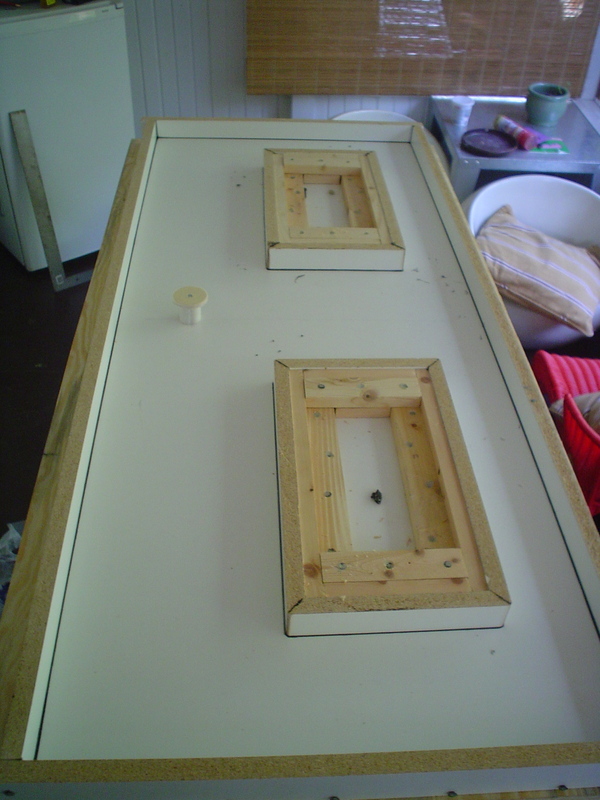 The undermount sinks (scottybsports) were also purchased on e-bay for about $50 each. 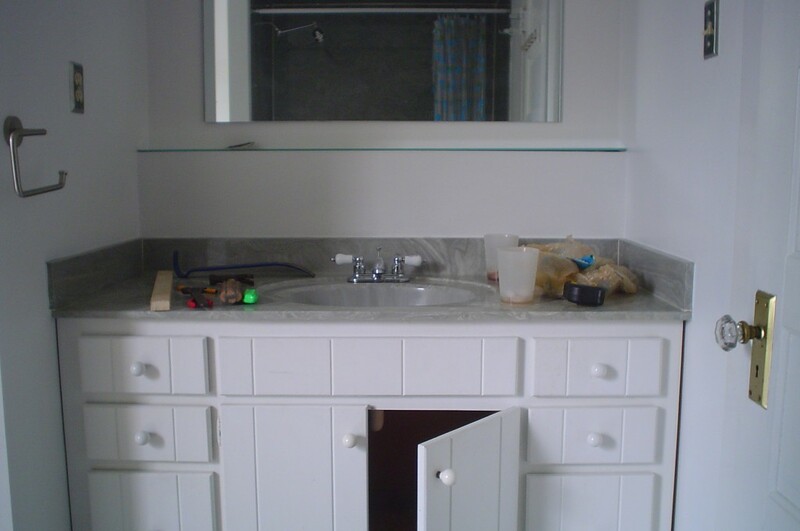 â€œUsed Quickrete 5000 concrete. Used super plasticizer, latex additive, powder pigment (use max pigment % weight allowed for the weight of concrete, if you want dark/black color). Used 3/8 rebar around edges, tied to sheet of 1/2â€³ hardware cloth with wire ties. 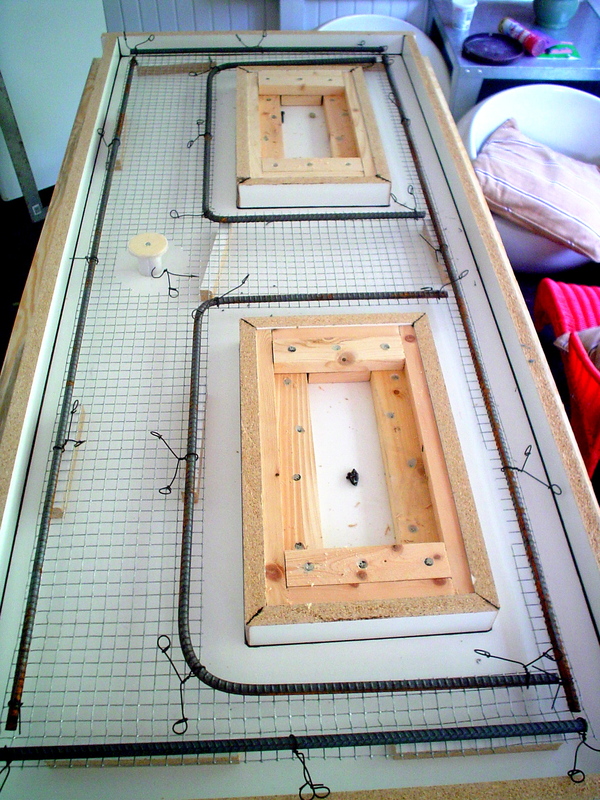 Suspended the rebar/cloth from the top of mold with wire ties until after the thumping to release air bubblesâ€¦or it would have sunk to the bottom of the concrete and you want it in the middle. Got supplies off ebayâ€¦from seller â€˜concrete-fabricatorâ€™. 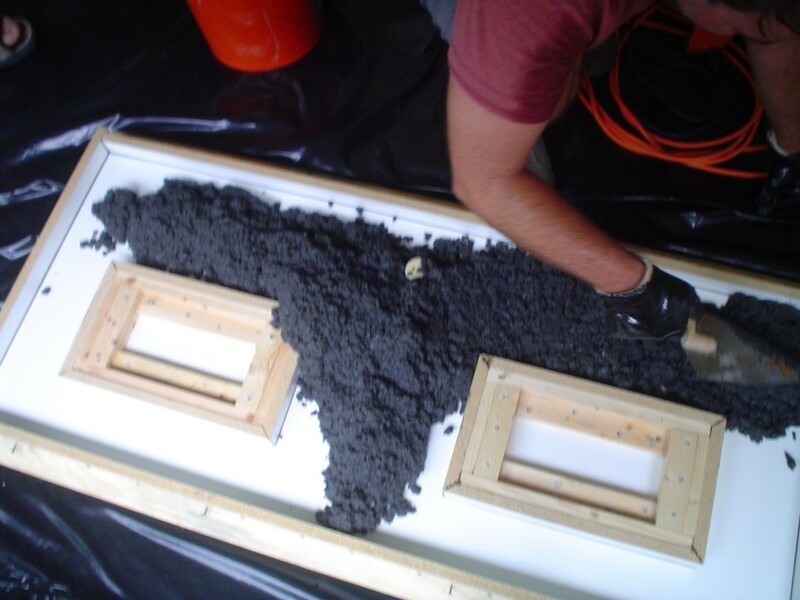 Superplasticizer and latex additive help reduce the amount of water needed to mix the concrete. Less water = good for the concrete mix. Do a slump test â€“ you want to make sure the mix is the right consistency. Mixing concrete with shovel is not funâ€¦rent a mixer. Used a palm sander with no sandpaper/cling film to release the air bubbles. Thump long time. 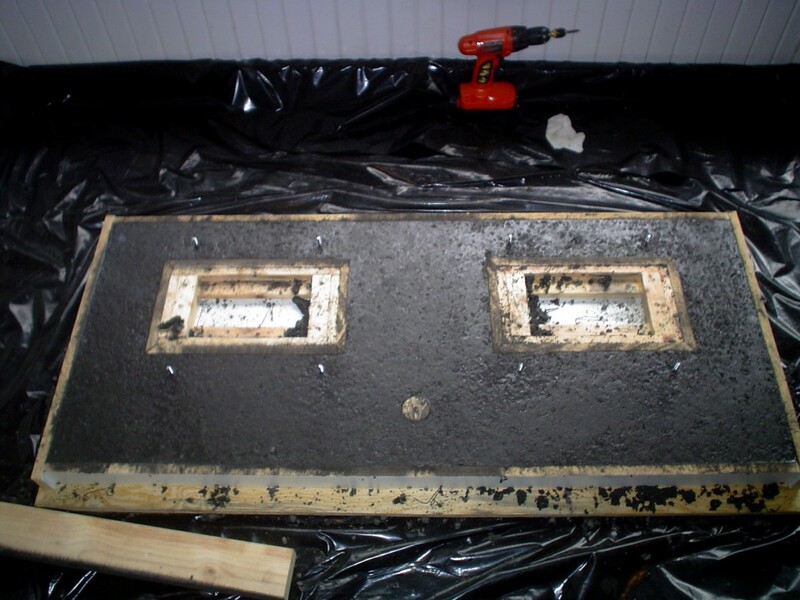 When cured and unmolded, filled holes with pigment/cement slurry (same pigment % by weight to cement as main batch). Grind/polished with diamond discs and a wet grinder. Wore a contractor bag with slits cut for arms and headâ€¦dirty water gets everywhere when wet grinding. 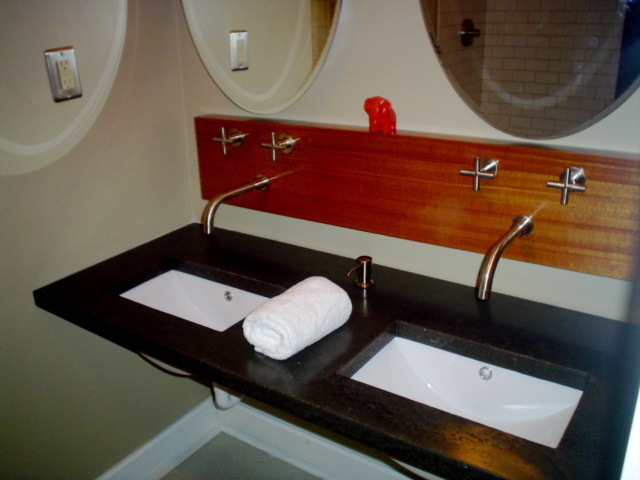 Previous Previous post: Hey, Hey – Is That Wenge?